Thank you so much for the email! I have just purchased the bear! I am very excited; I had all but given up hope that we would ever find another “Sniffy”. Braedy saw the picture of the bear and yelled, “Its Sniffy on TV!! !” Thank you! Thank you! Thank you! I have been searching for a backup for my daughter’s favorite bear for almost a year now, but have had no luck. I received “Sniffy” as a gift at a shower for my daughter Braedy. By the time she was a year, Sniffy was the obvious favorite of all the animals and now, at age 26 months, she refuses to leave the house, and sometimes any room in the house, without him. I am terrified that something will happen to this bear, and that my daughter will be heartbroken and that my perfect sleeper will stop sleeping! As it is, the bear is quite dirty, but I have a hard time getting him away from Braedy for long enough to clean him. His fur is also starting to disintegrate. I have family members, family friends and even Braedy’s day care provider on the lookout for this bear. They and I have searched the internet and scoured stores for a “brother” to Sniffy, to no avail. I am so excited to have found your site and hope that you or one of the visitors to your site may be able to help! 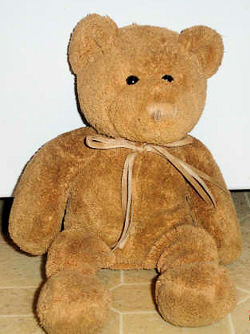 Sniffy is a brown bear, 10-12 inches tall, with a double bow (two shades of beige) around his neck. He also smells like powder which is how he got the name “Sniffy”. My daughter took to the smell before anything, I think. The tag on his rear says DanDee Collector’s Choice and he also has a Laurel’s Attic tag in hard plastic on his right rear. There is no product number that we can find. I have plenty of pictures to send (with plain backgrounds) but I don’t have a way to link them to this message. I would be happy to attach them though! If you could please help us, I would never be able to thank you enough. An extra one, two or three of these bears would give my husband and I such peace of mind; they would also ensure that my daughter remains a happy, easy little girl! Thank you for your time! Sorry Anonymous, but I don’t understand your comment.